How do Pennsylvania Libraries Address the Social Determinants of Health? More than 250 libraries from across the state of Pennsylvania--both urban and rural--responded to our survey. In our work with the Free Library of Philadelphia, we have learned that library staff are highly attuned to the needs of their communities. By responding to queries throughout the day, librarians learn about patrons’ concerns, hopes, needs, and priorities. Library staff also become vital community sentinels--people who can “take the temperature” of a neighborhood in order to report on current community health concerns. Building on our Philadelphia research, we capitalized on librarians’ roles as community sentinels by conducting a web-based survey of all public library directors in the state of Pennsylvania. We aimed to understand how community health concerns varied between urban and rural areas across the state. We learned that library staff actively address the social determinants of health, whether they operate in remote rural areas or densely populated urban centers. The full results of this survey were released today in the CDC’s online journal, Preventing Chronic Disease. The survey further explores the daily work practice of public library staff, with a focus on the social determinants of health. We received more than 250 responses from libraries across Pennsylvania. Mirroring what we have seen in Philadelphia, respondents from both urban and rural libraries indicated that they frequently interact with library patrons about their health and social needs - including help with employment, enrolling in social welfare benefits, and finding food - but that they feel underprepared by their professional training to address many of their patrons’ needs. Very importantly, we learned that 12% of Pennsylvania’s public libraries had experienced opioid overdoses in the past year. This finding is important in two ways. First, it shows that libraries are deeply affected by the opioid crisis and need resources and training to manage this public health emergency. Second, this finding offers “proof of concept” of the idea of library staff as community sentinels. Through this survey, and with the help of library staff, we identified clear insight into a public health issue that calls for rapid response. The results of this study inspired our team’s current work, in partnership with the Philadelphia Department of Public Health, on overdose awareness and reversal trainings at the Free Library of Philadelphia. We also trained about 75 librarians who attended the Public Library Association annual meeting, held in Philadelphia in March 2018. Lastly, we are preparing to roll out a national version of the survey, which will include a deeper dive into the impact on public libraries of the opioid epidemic and immigration issues. Stay tuned! This survey was conducted with support from the CEAR Core of the UPenn CTSA. You can read the full text of the study here and listen to the CDC audio podcast of an interview about the study with Dr. Eliza Whiteman here. West Philadelphia library staff graduates of the Community Health Specialist Training with Dr. Anna Morgan. We have had a busy year at the Healthy Library Initiative! We are excited to share two new journal articles from our team, both of which were published this spring. The first is an evaluation of our Community Health Specialist training program, which was released in the May issue of Health Promotion Practice. Being on the “front lines,” library staff are in many ways like health care providers or social workers. They routinely respond to questions and concerns about patrons health and social needs. Yet we have learned from our conversations with them that library staff often feel as though their formal professional training has inadequately prepared them for this central part of their jobs. To address work-related stress among library staff and to provide better resources to library patrons, the HLI team designed, implemented, and evaluated a Community Health Specialist training program here in Philadelphia to help library staff better recognize, engage, and refer patrons to appropriate health and social services - tapping into a strong network of community-based organizations in Philadelphia. Our study in Health Promotion Practice documents the effectiveness of these trainings based on pre- and post-training participant evaluations and qualitative interviews. Library staff participants reported significantly improved comfort, confidence, and preparedness in addressing the social and health concerns of patrons experiencing housing insecurity or homelessness, mental health concerns or substance use disorder, family trauma, or immigration challenges. The trainings in Philadelphia are ongoing and we have received numerous requests for training from library systems across the country, whose staff report similar challenges and a clear need for further professional training. The trainings were conducted with support from the National Network of Libraries of Medicine, the CEAR Core of the UPenn CTSA, the RWJF Clinical Scholars Program, and the Eisenberg Research Fund. You can read the article here and listen to a lecture on the evaluation by Dr. Anna Morgan here. Stay tuned next week for a post about our survey of Pennsylvania libraries in Preventing Chronic Disease. Linking public health education, research, and practice. 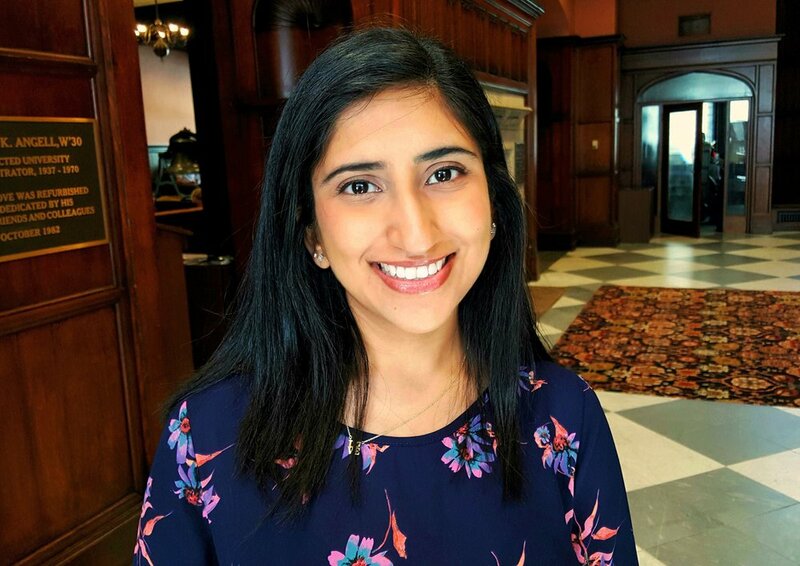 In spring of 2016, as a second-semester junior in the Health and Societies program at Penn, I had developed an interest in public health policy and sought to use my last few semesters to gain a concrete understanding of the many factors that influence health and the inherent nuances that accompany them. I knew that taking the Social Determinants of Health course with Professor Andi Johnson would help me achieve this understanding, but along with the important subject matter we discussed during the course came an opportunity to complement our theoretical understanding of the social determinants of health with a hands-on experience conducting community health research focused on many of the same concepts. Dr. Johnson partnered with Dr. Carolyn Cannuscio, Dr. Anna Morgan, and their team at CPHI, who graciously allowed our whole class to become research assistants for a semester on a project that explored how public libraries function as a health resource for vulnerable populations in Philadelphia. Our class collected data for an ongoing needs assessment in West Philadelphia; each of us conducted an interview with either a West Philadelphia resident, public library staff member, or a public health/medical professional to better understand the health needs of community members and the needs and experiences of library staff. We then analyzed the data for recurring themes and worked as a class to create a presentation to report back our findings to Dr. Cannuscio and her team, as well as the Free Library of Philadelphia. Our themes revealed several paradoxes, such as a “vibrant,” “diverse” West Philadelphia community unevenly exposed to fear, violence, and trauma and a community surrounded by renowned universities and hospitals, but an uneven access to education, employment, and power among its members. Ultimately, our class reinforced the trends Dr. Cannuscio’s team had seen in a previous needs assessment conducted in South Philadelphia: libraries are doing what they can to address many of the major health issues they see in their community, but they can only do so much given the resources available to them. Though not obvious on the surface, libraries are a health resource for the community, and library staff are required to wear multiple hats in their day-to-day activities, many of which they haven’t had formal training for but perform out of necessity to help their patrons. This exemplifies why it’s critical to support public libraries in our communities, because increasingly, they are one of the last few consistently reliable spaces left for children, families, and adults of all ages to feel comfortable and safe. This shared work was ultimately published in Health Affairs. I enjoyed working on this novel approach toward improving population health, so I took advantage of occasions outside of class to get more involved. Luckily enough, Dr. Cannuscio's team was looking for a research assistant for the following spring semester. I jumped on the opportunity and I’m glad I did. Since then, I've seen this research expand to new branches of the library, have been privileged to meet and learn from many of Philadelphia's community members, and significantly strengthened my quantitative and qualitative public health research skills. For example, after the needs assessment, I helped to administer and evaluate a Community Health Specialist training program for staff at the South Philadelphia Community Health and Literacy Center. This was a four-session program, each session focusing on a different topic: homelessness and housing insecurity, mental health and substance abuse, new Americans, and children and families that have experienced trauma. The goal was to equip staff with basic knowledge and resources to help patrons they encounter that are experiencing these struggles, which is a common occurrence. We taught participants, but in many ways, they also taught us by sharing their experiences and their ideas for how to work toward alleviating these issues we see in Philadelphia. This is only one of several exciting projects the Healthy Library Initiative is working on. The partnership between CPHI and the Health and Societies program proved to be a natural one: each entity shares the common goal of understanding and improving health by critically examining it in social context, while using a multidisciplinary lens to brainstorm solutions for society's most pressing ills. I’m thrilled to have been an example of how both HSOC and CPHI can work together to create an enriching undergraduate experience for students interested in public health and am excited to see this connection grow and flourish in the future. The Edible Alphabet program provides refugees who have recently arrived in Philadelphia with an opportunity to learn English through cooking classes at the main branch of the Free Library of Philadelphia. The teaching staff includes librarians, an ESL instructor, and a professional chef. Together they implement a curriculum centered on the preparation of a low-cost, healthful meal each week. The curriculum includes games and activities to help students learn American foodways and the language of cooking--food groups, types of foods, cooking techniques and utensils, measurements (e.g. cups, teaspoons, etc), and the fractional quantities of measurements. Each week is capped off with a shared meal, prepared by students from from many countries of origin, including Syria, Iraq, Iran, Pakistan, Congo, and Malaysia. My early impressions of the class have thus far been positive. In the first class, I was impressed by how well many students already spoke proficient English. I was even more impressed, however, by the desire of students who spoke good English to help those students who were just learning the language. I witnessed this willingness to help most strongly in a pair of young sisters from Southeast Asia. They were not only proactive in learning themselves, but also in taking leadership roles in the class. They were among the first to volunteer in the games at the start of the class and they were always highly engaged with and friendly to the other students. They were excited to inform us that they recently secured jobs at a local department store, despite their limited time in the U.S. In subsequent classes, despite our role as observers, we were drawn into the warm dynamic of the class and found it challenging to completely separate ourselves from the students. In fact, we interacted quite frequently with the students, often while they waited for instruction from the teachers or ate the food they had just cooked. We learned about the passion a man from Pakistan had for cooking. Roxanne conversed in French with a pastor from the Congo. I got distracted from taking notes by a six-year old Syrian boy who tried to teach me Arabic. And we always had students insisting that we try the dish they had just prepared. Overall, we were humbled by the generosity and kindness of the students. Americans visit a public library over one and a half billion times each year, more than four million visits each day. In contrast, Americans visit a physician's office just over 928 million times annually. What if library visits could be leveraged as opportunities to promote health? In Health Affairs, as part of the Culture of Health issue, colleagues and I from the Healthy Library Initiative analyze the ways in which the Free Library of Philadelphia, the city’s public library system, already promotes better health, and suggest what more it could do. In Philadelphia, a city of one and a half million people, the Free Library has five and a half million visits annually. That provides untapped opportunities to reach Philadelphians, especially vulnerable individuals for whom libraries often serve as a haven. Our team conducted an analysis of current library programming and a needs assessment of community members and library staff. We found that libraries are already working to promote health, but there are opportunities to do more to harness their power and potential. At their core, libraries are sites of literacy promotion and lifelong learning, and literacy is linked to better health outcomes from childhood, through adulthood, and into old age. A recent study also showed that reading more books was linked to better health. People use public libraries as sources for health-related information that they may not be able to get from the health care system, perhaps due to lack of access, time, language barriers, or feeling intimidated while speaking to a health care provider. According to a recent survey, over 40 percent of the information that patrons search for online at the library is related to health. Public libraries are also addressing the social determinants of health (i.e., nutrition, employment, education), which is crucial to reducing health disparities. In Philadelphia, the Free Library offers programming that includes nutrition classes at the Culinary Literacy Center and workshops at its job and career information center. These services are utilized by half a million people. Our analysis showed public librarians to be committed to public service, deeply trusted, and responsive to the needs of their patrons. Librarians report addressing almost any question asked of them - from assistance finding cookbooks about nutrition and interpreting official documents, to help setting up email accounts and writing resumes. However, library staff are often stressed by the tremendous needs of their patrons and lament that they feel ill-equipped to deal with the challenges of working as front-line staff in vulnerable communities. What else is needed? A first step in harnessing the power of public libraries to address population health is increasing library capacity. While the library often serves as a haven for vulnerable individuals, the formal training of librarians is often inadequate. Our team worked to address this gap by developing a training curriculum for librarians to “recognize, engage and refer” vulnerable individuals to appropriate resources. The topics selected for the training - mental health and substance use, homelessness, immigration, and childhood and family trauma - were identified by library staff and community members as the most pressing health concerns in their communities. We delivered the training in South Philadelphia, and preliminary analysis shows that the case-based training modules significantly improved library staff knowledge, confidence and comfort in addressing the needs of these patrons. We plan to repeat the training in West Philadelphia in the next few months. We must also work to build partnerships between public libraries, health systems, and public health agencies to encourage an interdisciplinary approach to patient care and well-being. An innovative model exists here in Philadelphia at the new Community Health and Literacy Center, which co-locates a health-focused library, adult and pediatric public and private medical clinics, and a city-sponsored recreation center. Finally, we should leverage the trusted role of librarians in their communities. Libraries and their staff are free and open to the public, rooted in the local neighborhood, and deeply trusted, making them a key partner in building a healthy community. While doctors may understand little about their patients’ lives outside the consultation room, librarians are embedded in their communities, and know their patrons’ daily routines and challenges. Library staff are in an ideal position to serve as “sentinels” in their communities. If we work with librarians to identify ever-changing health and community needs, we may be able to more rapidly address health concerns. Post by Anna Morgan. Originally published on Health Policy$ense. Libraries are a lifeline for vulnerable populations. We learned this straightforward, valuable lesson by listening carefully to our research participant, Brandon Stokes. Brandon told us about the many challenges he faced while growing up homeless. He also taught us how he coped. For him, the Free Library of Philadelphia was a refuge, offering a safe place to spend the day while the youth shelter was closed. Brandon often spent hours in the library, devouring biographies of great leaders. He searched those books for the male role models who were missing from his life. In their stories of adversity and triumph, Brandon found lessons for life. Today, Brandon is on a promising path. He is a student and an activist, and he is building a network of social entrepreneurs in Philadelphia and beyond. In this work, the Free Library of Philadelphia is still playing a critical role, offering a meetup space for like-minded go-getters who share the combined ambitions of business and social impact. We are inspired by Brandon, and we are grateful to him—and to many other research participants over the years—for telling us their own stories of adversity, resilience, and health in the city. Brandon’s example offered us a call to action, showing us how public libraries are places of hope and possibility. Today, we are committed to making libraries even stronger as “health hubs.” We are working closely with the Free Library of Philadelphia to optimize staff trainings, services, and programs that meet the health and social needs of diverse Philadelphia residents. We see this as one step in a national conversation about how we can strengthen public libraries and connect them to health institutions, in order to improve population health. We welcome your stories and your input. Let us know how your public library is working to meet the needs of vulnerable populations. Contact us at healthylibrary@gmail.com. To read more about Brandon and about our team’s research on youth homelessness, see Cannuscio et. al, The Life Stories of Homeless Youths. AJPH, November 2015 (105): 2216-2219.